I have been a sucker for scones ever since my Auntie S. made a batch of blueberry scones when I was in elementary school. I begged her to share her recipe with me, and I even invented my own little technique for stuffing blueberries in the middle of the scones. It was my solution for the messy, purple, staining mess that came with mixing blueberries into the dough. I don’t do that anymore (although my mom says she liked it that way), but I do still love to make cream scones! These days, I’ve been making a bunch to finish off that huge Costco bag of dried cranberries we have sitting in the pantry. You know. The 3-lb bag hubby requested but no longer wants. He’s lucky I love mixing them into scones, or there’s no way we’d be finishing that bag! I can’t say I mind very much, because these little pastries are super delicious! They are flaky and crisp on the outside, and fluffy and moist on the inside. Perfection with a cup of tea. Throw on some lemon curd if you have it on hand. During my freshman year of college, I learned from my friend Joanne that you should always sprinkle some sugar onto your scones. It adds a little touch of sweetness and a nice browned crunch on top. I have never strayed from that advice. Yum! Why yes, I am. And yes, it is. I love it when someone has a favorite :). 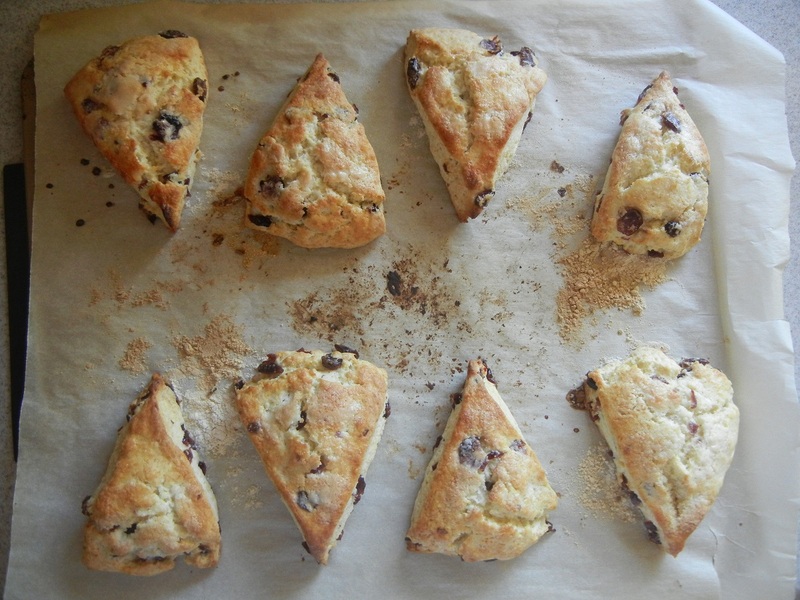 I’ve made lots of scones in my lifetime, but this one is my go-to recipe. 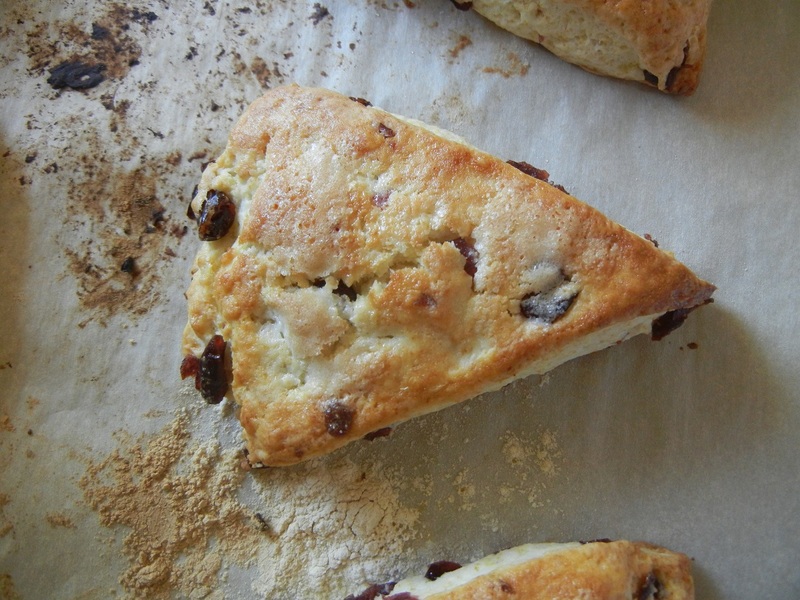 If you’ve been searching for your ultimate scone recipe, this one will be hard to beat. It’s easy, quick, and really scrumpdiddlyumtious! Combine flour, sugar, baking powder, and salt in a food processor. Add butter and pulse to combine, about 10-12 times, to make a coarse meal. Add fruit and cream and pulse to incorporate, about 3 times, just until the dough comes together. Turn out onto a floured surface and knead 7-9 times until the dough forms a smooth ball. Pat into a round circle about 1″ high, then cut into 8 wedges and lay on a parchment-covered baking sheet. Brush the 2 tablespoons of cream on top of the wedges, and sprinkle evenly with a thin layer of sugar. Bake for 10-13 minutes, or until the tops are golden brown. Remove and let cool on a wire rack. 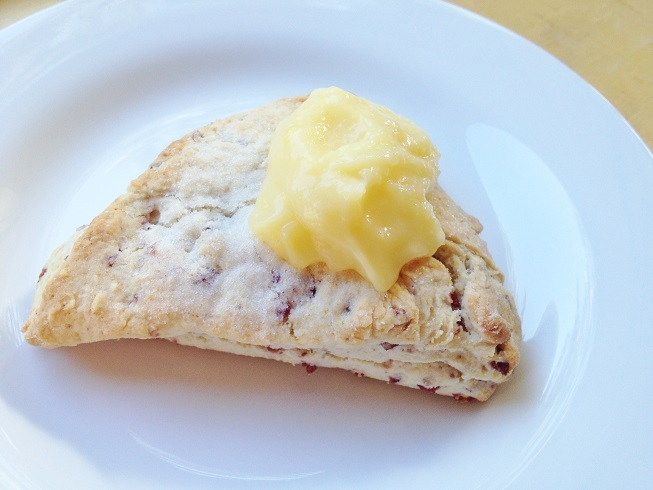 Enjoy a scone while it is still warm, or toast to reheat later. Delicious! If you are making these for a party or tea or something, then divide the dough into 2 discs in step 3 and continue in the same way. You’ll get smaller scones, which is more manageable to eat when there’s lot of other food :). 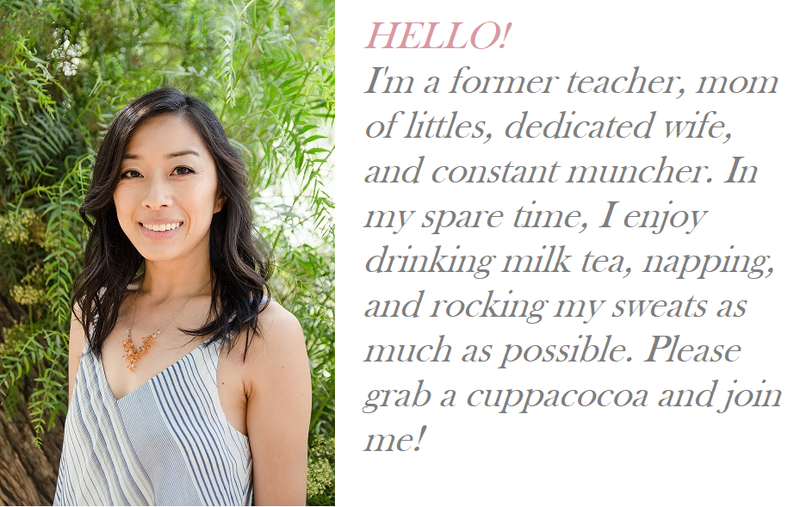 JoEllen, I love your blog. Thank you. I’ve borrowed some of your advice for when I teach Sunday school. I’ve been craving lemon scones since I tried one at this great local coffee house and I’ve not been able to replicate the recipe. But these looked so good, I told myself I’d come back to your recipe and try your scones. I omitted the cranberries and used some lemon extract, just what I wanted. They are light and moist and just right. Thank you. Hi Stephanie! Thanks so much for reading! It means a lot to me, especially knowing that you can use it and apply it for teaching kids :). I’m also delighted to hear the scones worked out for you! Mmm lemon scones! Sounds yummy! Glad you can enjoy them :]]. Thanks for dropping by to leave a comment! I will definitely have to try this one when I have a minute. 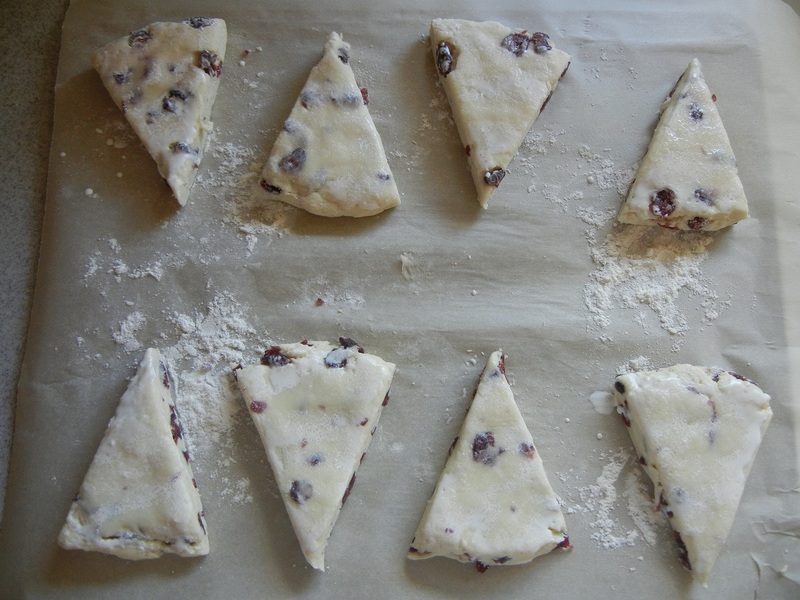 I have not tried scones, because I fear they will be like pie dough – which I am absolutely hopeless at! Small, blueberry-sized pieces of frozen fruit works just as well! Same directions. Just be prepared for a colorful mess if they are berries… :).